Canada's former prime minister and the current premier of Saskatchewan both took to Twitter Thursday to promote the same message — it's vital Alberta's conservatives remain united to defeat the NDP in the upcoming spring election. 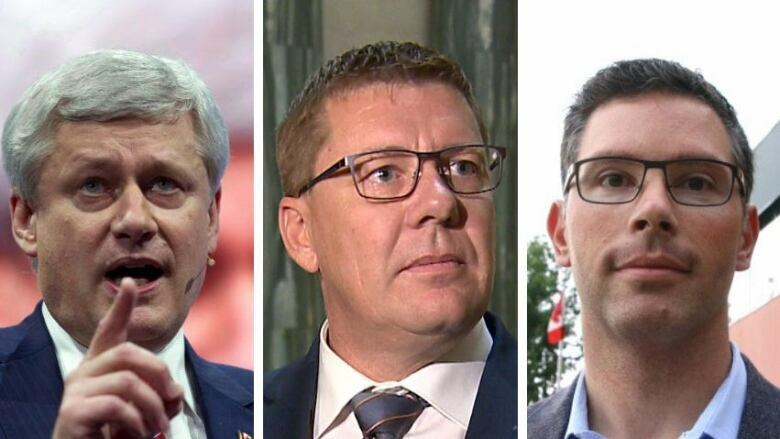 Canada's former prime minister and the current premier of Saskatchewan both took to Twitter Thursday to push the same message — it's vital Alberta's conservatives remain united to defeat the NDP in the upcoming spring election. "Prior to the formation of the [Saskatchewan Party] 20 years ago, our province was the example of what dividing the free enterprise movement will do: electing NDP governments, over and over again," Premier Scott Moe wrote, in a tweet retweeted by former premier Brad Wall. The social media posts followed what former Wildrose Leader Brian Jean called "rumours" — that he would be running as leader for the Freedom Conservative Party, setting himself up as a competitor to UCP Leader Jason Kenney who defeated him in the party's leadership race in 2017. A social media frenzy followed, with plenty of speculation over whether or not Jean's hypothetical return could split the conservative vote just one year after two parties united in an attempt to prevent that very outcome. Doug Schweitzer, who ran against Kenney and Jean during the UCP leadership campaign, and is now a candidate for Calgary-Elbow said the speculation is a "slap in the face" to the party. Former prime minister Stephen Harper said "personal ambition and fighting old battles must take a backseat" for the province's best interests. "Jason Kenney received an overwhelming mandate from Alberta's conservatives to lead us into the next election. Everything that has occurred since has shown that party members made the right choice." Moe said in a scrum following the legislature's question period he wasn't trying to sway Alberta's upcoming election, but simply offering the province some of his own experience. "We've seen an NDP government in Saskatchewan, I don't think they're the best thing for our province's economy and our province's opportunities," he said. "The ultimate formation of the Saskatchewan Party just over 20 years ago came about by this very realization that when we unite and set aside our differences … we've become successful." But Moe said he doesn't expect the comments to hurt his relationship with NDP Premier Rachel Notley, who he said he has had a strong working relationship with despite disagreements over policies like the NDP's carbon tax. "I am making comments with respect to a shared interest we have with the strength of our economy," he said. Jean has stayed largely out of politics since he resigned as an MLA in 2018, but in recent weeks he's spoken up a few times to take shots at Kenney. The former Wildrose leader tweeted that any big political news coming this week won't involve him. CBC News has reached out to Jean for comment. Kenney said in a teleconference he's not going to be distracted by the speculation and he won't let it impact the UCP's growth. "It's not about political games. You don't have any fear of the repeat of the last election where the conservative vote was split," he said. "That's exactly what the NDP wants."